Dinlos and Skilldos: Orangie Boom! 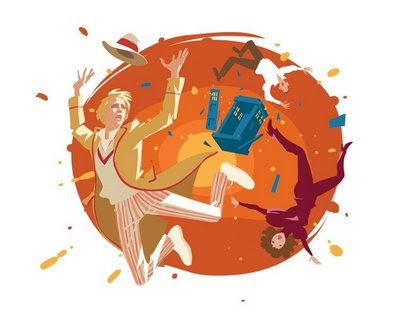 Here's last month's spot illustration for Doctor Who magazine. It's for an audio adventure called Time Reef. Mindful of other illustration blogs that include roughs and pencils I'm sticking up the process for this illo. I produced a quick colour rough with my faithful wacom in Photoshop, DWM approved, then I did some finer, "proper" figure drawing type stuff (also in Photoshop) before exporting it over to Illustrator. I should point out that the folks at DWM, aware of my various styles, asked for something not too cartoony. In Illustrator I just draw over the top of the image freehand using the pencil tool with the stroke set to zero. Most illustrators use the vector tools to make perfect shapes. The truth is I didn't understand how to use illustrator when I started (still don't!) and so picked up the pencil tool and started drawing shapes of colour and sticking them together. The Monk and Cat image from the Guardian that sits in the top right corner of this blog page is an early example of my Adobe Illustrator stuff. I'll be starting on my next spot illo for DWM soon (a Colin Baker one! Eek! ), I've had the brief for a couple of weeks, but I haven't got a clue what I'm going to do with it yet. It'll certainly be done in Illustrator though, I love the way it leaves drawing looking so immediate and fresh. Perfect for spot art that should have impact without becoming dominant and distracting. Basically Adrian Salmon's Time Team illustrations are perfect for the magazine in that respect, mine are attempting to do a similar job. Lovely, and I think you're being modest about Illustrator leaving the drawing looking fresh and immediate, that's purely down to your drawing and how you use the program. For some people it deadens what they do but definitely not in your case. I just can't get to grips with Illustrator much at all, I always feel like I'm fighting against it whenever I've tinkered about with it, I find it remarkably unintuitive (as if a mathematician designed an art program) and I admire anybody that can use it well. Have you tried just drawing freehand with the pencil tool set to zero stroke weight? Like I say, I came across this technique by accident and ignorance, but it does make the whole process more immediate and intuitive. I know what you mean about it being very geometric, the pen tool is really confusing when you first use it. I'll have to give that method a go. I'm currently using Illustrator for lettering, I'm just about getting to grips with that...slowly learning the mysteries of the pen tool for the occasional balloon and for making tails. I'm normally okay at getting to grips with most software but I do seem to have had a bit of a block when it comes to Illustrator. I am doing an illustration degree at Cambridge, I need to find out a few illustrators opinions for my dissertation, would you be prepared to answer a few questions??? Please.